^ Timur. Chicago: Encyclopædia Britannica Online Edition. 2011. ^ Josef W. Meri. Medieval Islamic Civilization. Routledge. 2005: 812. 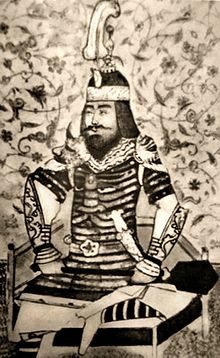 ^ "Belonging to a minor military family, and of Turkish origin, Timur was born in Transoxiana (present-day Uzbekistan) in the fourteenth century. He rose to prominence in the service of the local Mongol ruler, claimed to be descended from Chingiz-Khan, and defeated all competitors." Massoume Price. Iran's Diverse Peoples: A Reference Sourcebook. ABC-CLIO. 2005: 56. ^ David Eugene Smith. History of mathematics. : 289. ^ Science institutions in Islamic civilisation, Science and technology in the Turkish and Islamic world. Science in Islamic civilisation: proceedings of the international symposia. ^ A.J.J. Mekking. The Global Built Environment as a Representation of Realities. Amsterdam University Press. 2009: 121. ISBN 9789087280635. ^ Timur. Encyclopædia Britannica, Online Academic Edition. 2007. ^ ., Quotation: "... Timur first united under his leadership the Turko-Mongol tribes located in the basins of the two rivers." Central Asia, history of Timur. Encyclopædia Britannica, Online Edition. 2007. ^ History of Central Asia. Encyclopædia Britannica Online. 13 December 2008. ^ "Tīmūr Lang" entry from B.F. Manz. Encyclopaedia of Islam. ^ 钦察汗国（下）. 東華理工大學圖書館. [2014-03-09]. （原始内容存档于2014-03-09） （中文）.